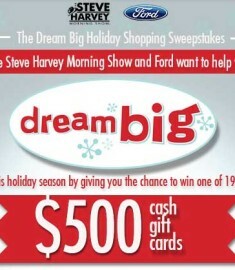 Enter to win the Steve Harvey Dream Big Holiday Shopping sweepstakes for your chance to win a $500 cash gift card! Would you like some extra money this holiday season? I know $500 would help make my Christmas a little merrier! Enter now or at least before the closing date of December 19th, 2013 for you chance to win free cash! 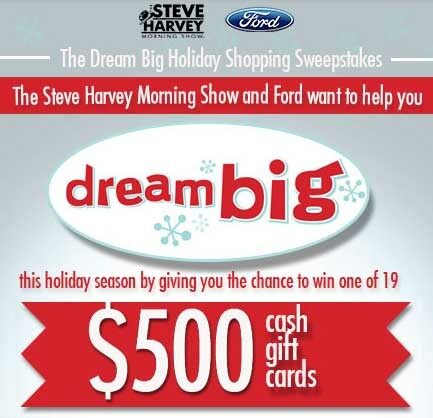 Visit the Steve Harvey website and register with the fan club, then fill out the online entry form for your chance to win the holiday cash giveaway. This is a great Holiday Shopping sweepstakes that would make all the difference to my holiday gifting abilities this year! This is the time of year when budgets get stretched and finances can get ruined, all in one little month of gift giving and good times! Do not blow your 2013 budget and keep your money where it needs to be (in your bank account). If you win $500 in this Holiday giveaway then you can buy gifts for loved ones and save your self a pretty penny! I love Steve Harvey, he really brightens up my afternoon on his talk show, and I am so pleased for his well deserved nomination for the Daytime Emmy Awards. Enter today and win big. Good Luck. Gd morning , Me an my family tryn to move back wit my father for tha holiday I havent seen him in years… That would be my greatest gift . Im a 30 year old single mom who lives in Riverdale,Ga. I have no idea who will read this. I’ve been outta work two years since laid off from Clayton County Schools. I just recently started working part time. I have no car and I’m behind on my rent. I just received an eviction letter. My only wish is that I can get some kind of assistance so my kids can have a place to live. I’m a Christian and I do know that thru Christ all things are possible. Whoever this may reach please ready with an open heart and mind. Steve i think this would be a wonderful gift for me and my family. Winning would mean so much to us. My husband is in stage 4 of liver disease and we have no money to buy our family Christmas ggifts or to even be able to buy food. Christmas has always been our favorite time of the year, to celebrate the birth of our Lord Jesus Christ. And our children and grandchildren do celebrate the true meaning with us and do not expect anything, but to be able to give them something no matter how small would be a true joy for my husband. He feels it is his fault we are in this situation. It breaks my heart because it is no ones fault he has battled cancer for so many years and has not been able to work. God has blessed us with extra time together because the doctors gave him six months to a year. I am in need of some money at this time, you see I survived a heart attack back in January and I have not worked since then, basically my husband is the sole provider now.I watch him come home every night , he is so tired that he can’t even make it tomour bed , he falls asleep right there on the sofa.This blessing wouldn’t just be for my children alone, but for my husband who worries that he with all those extra hours of work, still won’t be able to pay bills and provide Christmas gitfs too. iam a 67 year old mother of two great children and agrandmother of 6 grandchildren I watch your show steve Harvey everyday it makes me happy even if I have a bad day thank you for this love you. I wish for a happy holiday season for all troops serving our country keeping us save love to all love a great nanny sue. I am a 67 yr old Great Grand Mother with 4 Great Grands living with me I am on a fixed income of less than $850. per month no one is on the County Parents dont have a job and I am at my witts end. So far I have nothing to offer them but love. We need your help badly. I am a 66year old retired single lady, but I am working another job to help my grandson who is very sick and cannot work. He is 22 years old and I am trying to get him on disability.. He has a son that I am paying child support. I also help my daughter out also, because she work very hard to make ends meet. Everyone always wondering why I am working so much but social service does not help her pay nothing. I would like to get a gift certificate to help her for Christmas. Thank you. I feel as if it’s my time to reap a harvest, since ive been sowing into others life. I love giving gifts to my family and friends and has done that for 30 + years. Even when I’d go on vacation I would try to bring everybody a little something. I’m the 2nd oldest of 13 children so I guess my “muh” raised me to become a giver. I also give gifts to my Sunday school class every year and usually shop for bargains all year so I can have enough. Winning these prizes would be awesome. I can just see family and Sunday school classes leaping for JOY! Thank you Steve for the generous gift of giving at Xmas, i love you so much and your family and your show… i am so thrilled to be able to enter this contest for the 500 cash,, oh man do i need it.. We have no presents in this family because of job losses.. but i am so thankful to be alive and able to Watch your show.. you are sUCH a great host and very funny and for real..love you on family feud also.. God bless and stay healthy! I am 68 years old and have not much of anything as far as money but i am still celebrating my health and strength! I crack up everyday when you told the story about the woman who cusses in Church! LOL!! This christmas is going to be not the same, my girlfriend recently had her stomach totally removed from a serious case of stomach cancer, from doctors bills to the ten percent chance of living, we just dont have the money to show each other, it would be a god send to win.i just want to show her a christmas shell never forget, thank u very much. I want to keep it real, I have been unemployed since june of 2013 and I just got 2 part time jobs and I really need this money to help pay some very over due bills and to help my daughter get her kids some Christmas toys. This money will be a Blessing to me and my family. God Bless you and everything that you are doing for people. My family has had a trying time. Almost lost Mom,.,… But GOD!! Some nice gifts to give my family would be nice. Mom watches your show everyday as do we all. You make us laugh, and we so appreciate you for that. Laughter is good for the soul, like medicine. Thanks for providing our “meds”. My husband and I have been married 53 years and wouldl love to take a vacation anywhere, just the two of us as we never even had a honeymoon. We raised three children and also a brother in law teenager and a grandaughter. I just retired 5 weeks ago and my husband still works part time so we havent squandered our time or money. Please help our dream come alive. Hello I have no one to spend Christmas with . I will be spending it alone family are out of town and I couldn’t” afford to travel with them .I have already spend Thanksgiving Which was also my Birthday alone . I would like to win so I can take myself to a nice restaurant and buy a nice outfit to wear . Thank you and Merry Christmas . I hope I am lucky and win . I would love to win this because my husband and I have never been able to buy a gift for each other for Christmas, birthdays or our anniversary. We will be married for 5 years on Valentine’s Day 2014, and we have never been able to afford to buy each other a gift. It’s not the gift, it’s the being able to buy him something that would mean a lot to me. Thanks and may the Lord continue to bless you and your family. HI, STEVE …..I SURE COULD USE THE GIFT CARD TO GET SOME WORK ON MY ,CAR. THE CAR I HAVE IS 2002 PT CRUISER. SINCE NY MOTHER DIED IN AUGUST, SHE WOULD, LET BROWERS, A LITTLE MONEY. RIGHT NOW I TRIED TO PAY FOR THIS HOME, THAT ME AND MY FATHER AND SISTER SHARE. ALL MY MONEY GO TO KEEP A ROOF OVER MY HEAD. MINE SISTER DON’T WORK, SO THAT MADE THE LOAD EVEN HARDER. THIS MONEY COULD HELP ME FIX MY CAR. I WORK VERY HARD AT THE LOCAL WALMART WHERE I LIVE..I KNOW THEIR A ”GOD” OVER MINE HEAD….ALSO I JUST LOVE YOUR SHOW…BE NICE TO MET YOU SOME DAY…VIVIAN IN LOUISVILLE ,KENTUCKY…4512 MICKLENBURG CT 40245.. THANK YOU…. Steve hi I’m not going to lie I just really need the money I want to take my son on a shopping spree for a chance instead of just been able to by him one or two per of jeans at a time. I want him to see how it feel to come home with more then one bag. Thank you in advance. Hope I win so that I can make some children happy because their parents can’t provide for them. I would love to win something to help my sister Sabrina out. she is sickly and rising for grandkids by her salve. I just move over her in Maryland by myself after a 35yrs. with my husband. as I watch her do it day after day. I say I wish I could take her on a get away or something. the age are 16-4 years of age. please help me. I’m a disabled grandma of 5, would like to give my grkids some Christmas Cheer. Would love to win the 500. My grandchildren would like a merry Christmas with enough to eat. Out of nine boys and three girls I’m the only one in the family with no children, I would love to be able to surprise my nieces and nephews with a wonderful Christmas. raised a grandson since he was 2 months old and on December 22, he will be 19.
in your prayers as we thank God for you and your shows being in ours. I am requesting all the free gifts you gave to audiences today Dec. 20th 2013 on your show that was aired interviewing the our President, You informed those of us watching by T.V to go online and register for these gifts and so I believe by faith I could be a candidate of these free gifts and could really use them. as well as enjoy them. I am one of theses people who have never really won anything, so to have these gifts from you for Christmas would really blow my mind and make my day. you really, really,really inspire me so very much and I listen to The Steve Harvey Morning show every morning accept you was not on this morning and your talk show every day I actually records your show on DVR and family feud everyday and one morning you was Praising and Thanking God on your radio show I had just gotten off work and you was encouraging people from all walk of life and I told my sister that if I was not already save I would have gotten save that morning and I wanted to share that with you how you really, really. really inspired me and you also went to boot camp and you visit with couple of Drill Sargent there I don`t know if you recall this but the on Drill Sargent Name Drill Sargent Tyrone McCoy is my nephew you took picture with them so I have a couple photo of you and them and the other Drill Sargent I am originally from Texas but I live in Indiana now I just wanted you to share that with you.